The Luskin Center teamed with Edison International and Southern California Edison to develop a roadmap for the creation of a wide array of curricula to train the workforce required to meet the demands of transportation electrification. The report Transportation Electrification (TE) Curriculum Development produces: 1) an analysis of the existing state of TE-specific education and training and 2) recommendations for the future of TE workforce training, developed out of stakeholder engagement. Increasing TE demand is driven in large part by a new era in the commercialization of plug-in electric vehicles (PEVs). Although PEV markets are still young, the vehicles are the road today will shift billions of miles of driving to clean electric-drive operation, and PEV adoption is expected to increase significantly in the coming years. This early progress has been achieved in spite of educational deficiencies in the workforce supporting transportation electrification (TE) supply chains. 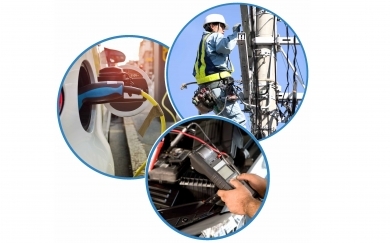 These supply chains include for PEVs, charging stations and electric grid modernization. TE supply chain are supported by workers requiring a wide range of skills–including electricians,computer specialists, infrastructure installers, PEV-readiness planners, utility planners, corporate strategic planners, and scientists–yet there are relatively few educational and vocational programs dedicated to TE relevant training. This project addresses this gap. Through the engagement of educational, industry, and other collaborators, this project seeds a multi-phase process of transportation-electrification (TE) curriculum development. 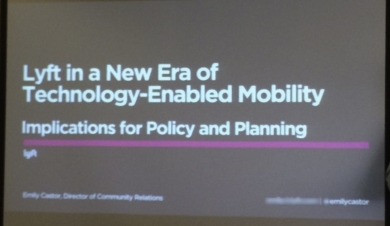 On Dec. 8, the Lewis Center hosted a presentation about ridesharing transportation services based on smartphone technology and “access over ownership.” The Center invited Emily Castor, the director of Community Relations at Lyft, to speak about implications for policy and planning as these services begin to increase in density. Over the last 2.5 years, Lyft has provided over 10 million rides and has affected mobility in several ways. Castor said these services can promote a car-free lifestyle and provide transportation options in underserved areas. Despite some ideas that Lyft is only available in high socioeconomic neighborhoods, Castor discussed the different ride sharing features Lyft offers and its reliability different areas regardless of socioeconomic profile. She also provided insight into the new industry’s development and how it will impact consumer behavior. For instance, people’s sensitivity to price presents the potential for systems that allow people going the same direction to share a ride. Adopting this feature in high density areas can reduce the cost for consumers up to 60% and benefit drivers who earn more per ride, she said. These features, such as the Lyft Line system, have already launched in San Francisco and Los Angeles. “The more people adopt this service, the better match rates customers get,” Castor said. Though these services and features have much potential for mobility in cities like Los Angeles and San Francisco, there are questions remaining about successfully implementing and evolving them. For instance, Lyft’s upcoming launch of incidental carpooling will allow drivers to filter customers to focus on the driver’s designation. However, it is likely this would work best when there are events happening in the area. “For carpooling to be mainstream, it needs to be flexible, reliable, quick, trustworthy and lucrative,” she said. Public Policy student Begoña Guereca contributed to this report. When you see a new development being constructed, the first thing you might think is how much traffic it might bring to your neighborhood. (Well, that and will there be a good coffee shop there.) You may not be aware that developers pay more in costs based on the estimated number of new trips their developments create. But when that new coffee shop gets put into your neighborhood, how many new trips are really created? Developers must evaluate how much a new project will add to local traffic levels. If deemed necessary, developers must then invest in substantial capacity-adding projects, which can make some infill projects financially infeasible. But how much new vehicle traffic are developments creating, especially in smart growth areas? When you buy a car, you may not be thinking of the effect you have on other people. But more and more, we see that there are public costs to private choices. Your car may produce more pollution than another car, thus leading to an environmental impact affecting others. But what about the weight of your car? How does that affect others? Fuel-Efficiency Standards: Are Greener Cars Safer? The United States has strengthened its fuel efficiency regulations several times in recent years in an effort to reduce environmental, economic, and energy costs. These standards have led to an in increase fuel efficiency by manufacturing lighter, lower-horsepower vehicles. But are these new fuel-efficient vehicles safe? At one time, it looked as though humanity might go on a greenhouse gas (GHG) diet simply by running out of fossil fuels. But due to new and improved technologies for finding and extracting oil, including extraction techniques like fracking and horizontal drilling, we are far from running out of oil. So how do we cut back on GHG levels, and the environmental impact they have, if we’re not running out of oil? When it comes to making a list of things people are excited about, parking meters are not just near the bottom, they’re not on the list. So how can government officials gain local support for parking meters? Donald Shoup’s answer: grant parking discounts to residents. American Women Less Likely to Bike Than Dutch Women, Here’s Why Domestic roles influence the cycling habits of women across the world. The UCLA Institute of Transportation Studies’ Herbie Huff and transportation policy and planning doctoral student Kelcie Ralph say that American women are less likely to bike than Dutch women, largely to differences in domestic roles rather than infrastructure. Their claims that infrastructure does not account for the differences in male and female bikers are supported by Ralph’s research, which reveals disparities between Dutch culture and labor policies as well as the gender gap of bikers in the U.S.
To learn more about their solutions to these disparities, you can read the full article here. Urban Planning Professor Donald Shoup Received his second Rapkin Award for Best Article in JPER The Chester Rapkin Award for the Best Paper in JPER is intended to encourage the submission of high quality papers. Shoup Receives his Second Rapkin Award for Best Article in JPER The Chester Rapkin Award for the Best Paper in JPER is intended to encourage the submission of high quality papers. The Chester Rapkin Award for the best article to appear in this year’s Journal of Planning Education and Research goes to Urban Planning Professor Donald Shoup for “Graduated Density Zoning.” A shorter version of the article has also been published in Zoning Practice. The award will be presented at the annual ACSP awards luncheon which will take place in Arlington, VA, October 3, 2009. Shoup and co-authors Jeffrey Brown and Daniel Baldwin Hess, received this award in 2004 for their article on “Fare-Free Public Transit at Universities“. The Chester Rapkin Award for the Best Paper in JPER was established in 1987 to honor Professor Rapkin at his retirement. It is intended to encourage the submission of high quality papers. Award-winning articles reflect the scope of Rapkin’s work and have ranged from multi-attribute evaluation to the challenges of participatory planning. Institute of Transportation Studies Contributes to New Sustainable Transport Program The Program for Sustainable Transport brings researchers together from more than 30 disciplines on six campuses to seed multi-disciplinary initiatives. The University of California Institute of Transportation Studies (ITS) Multi-campus Research Unit received a major grant to create a new Program for Sustainable Transport. The new program, supported by an initial 5-year award of $6.25 million from the UC Office of the President, was selected under the auspices of the Multi-campus Research Programs and Initiatives (MRPI.) Leveraging the substantial capabilities of ITS, The Program for Sustainable Transport designs tools, policies, and programs to reduce congestion, oil use, local air pollution, and greenhouse gas emissions, in ways that contribute to economic growth and social well being. The program focuses on three specific integrated activities: vehicles and fuels, infrastructure investment and system management, and land use and mobility planning. The new Program for Sustainable Transport supports research, education, and outreach activities on six UC campuses: Berkeley, Davis, Irvine, Riverside, Santa Barbara, and UCLA. UCLA ITS director, Brian Taylor, and associate director, Allison Yoh, contributed to the creation of this program; Taylor will serve on the program’s executive committee. The Program for Sustainable Transport brings researchers together from more than 30 disciplines on six campuses to seed multi-disciplinary initiatives, including collaborations between economists, geographers, ecologists, city and regional planners, public policy analysts, engineers from civil, environmental, electrical and mechanical engineering, computer scientists and experts in energy. In addition to cutting-edge research targeted at key societal needs and key state initiatives that are unfolding over the next few years, this new program supports the training of the next generation of experts and leaders. UCLA researchers in the Institute of Transportation Studies, which is housed in the School of Public Affairs, are slated to focus on infrastructure investment, system management, land use, and mobility planning in their work with the center.